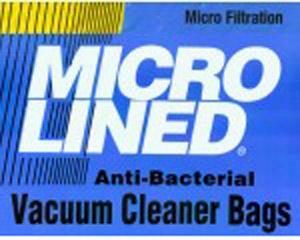 Micro-Lined® bags use a revolutionary non-woven inner liner. This micro-filtration media is formed of electrostatically-charged discontinuous polypropylene microfibers, which makes for an extremely efficient filter as well as a stronger bag with higher dust-capacity. Envirocare brand bags. Style U-3 & U-6. Fits most all Panasonic upright vacuums with top-fill bags including all current production models. These bags capture microscopic particles and germs and bacteria as small as 0.1 microns. Sold 9 bags per pack.